Berkelium is a transuranic member of the actinide series, with a silvery-white appearance. It does not occur naturally, and therefore was synthesized rather than being discovered. This synthesis was first accomplished by the team of Seaborg, Ghiorso, and Thompson at the University of California, Berkeley. This same team had been the first to produce americium and curium in 1944, and produced both berkelium and californium in 1949 and 1950. Americium had been given its name as a nod to its lanthanide analog that sits directly above it on the periodic table, europium. Likewise, berkelium was named after the city of its discovery just as its lanthanide analog, terbium, had been given a name derived from the town of Ytterby, Sweden, where the rare earth minerals were first found. Berkelium is produced by bombarding uranium or plutonium with neutrons in a nuclear reactor, and can be separated from other products of these reactions with relative ease, compared to some of the other transuranic elements. Berkelium is a poor candidate for use as nuclear fuel due to an extremely low fission cross section for thermal neutrons. It is primarily used in the production of other transuranic elements, and all of its other uses are in basic research contexts. Berkelium is extremely dangerous, as it is both highly radioactive and prone to accumulating in skeletal tissue. It is only used for scientific research and to produce some of the heavier actinides. Berkelium is a Block F, Group 3, Period 7 element. The number of electrons in each of berkelium's shells is 2, 8, 18, 32, 27, 8, 2 and its electron configuration is [Rn] 5f9 7s2. The berkelium atom has a radius of 170.pm. In its elemental form, berkelium's CAS number is 7440-40-6. Berkelium is a radioactive element produced in nature by beta decay and neutron capture in highly concentrated uranium-bearing deposits. It is the rarest naturally occurring element. Berkelium was discovered by Stanley G. Thompson, Albert Ghiorso and Glenn T. Seaborg at the Lawrence Berkeley Natinal Laboratory in 1949. It was the fifth synthetic transuranium element of the actinide series to be discovered. Berkelium information, including properties, research, applications and other useful facts are discussed below. Scientific facts such as the atomic structure, ionization energy, abundance on Earth, conductivity and thermal properties are included. 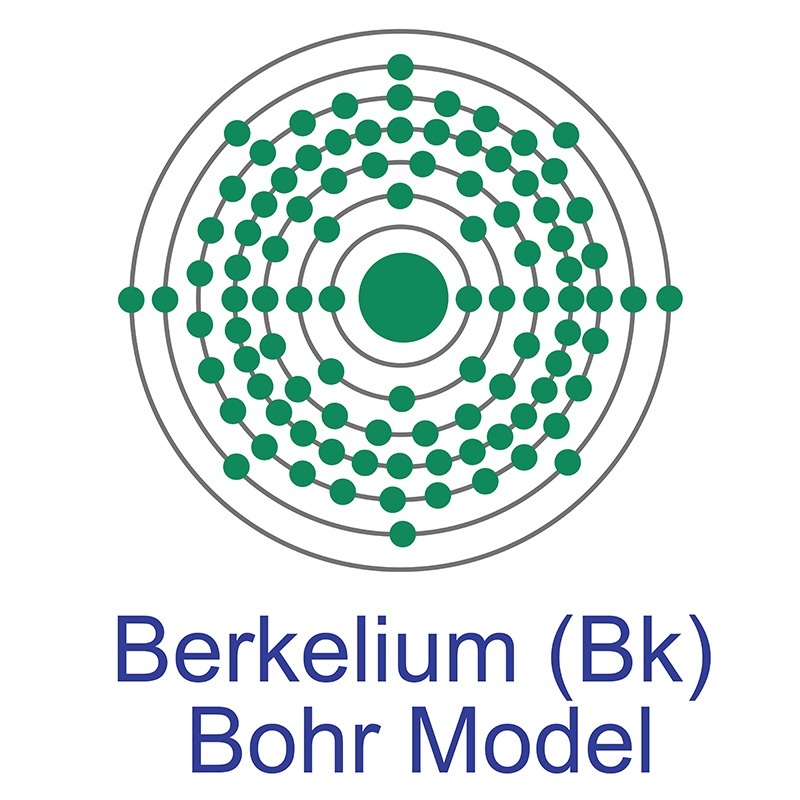 Berkelium is an artificial element. It has no stable isotopes.